Inside the Megalopolis: Rice Krispies back in Mexico! Rice Krispies back in Mexico! It's amazing what foods you begin to miss when you've been away for awhile. While I was living in Michigan, I craved breakfast tacos. While living in Florida, I missed Mexican Coca-Cola, and in Mexico City I longed to hear my bowl sing "Snap, Crackle, Pop!" I'm not sure why. I was never a huge fan, but I guess you always want what you can't have. On trips back to the States, I always had to have at least one bowl. I even asked my sister, Marisol, once to stuff a bag of Rice Krispies in her suitcase when she came to visit me (which she graciously did) from San Antonio. Then a few days ago, while online grocery shopping, the familiar blue box popped up on the computer screen. Was this an Internet hoax? Surely, there was some mistake. But I clicked on the "add to cart" button, and hoped for the best. When the groceries were delivered, I frantically scanned through all the bags. And there they were---those three little guys just like I remembered. Apparently, Mexicans enjoyed Rice Krispies too until about 20 years ago when they misteriously disappeared from grocery store shelves. For whatever reason, they are now back in Mexico, ready to win over a whole new generation. So Snap, Crackle, Pop or Pim Pum Pam! (as they say here) to everyone! Good news! 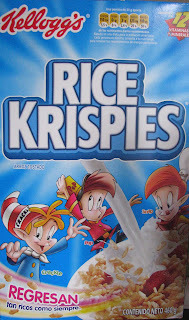 I also remember trolling the aisles of Gigante when I first arrived, sad to discover that Krispies only came in Cocoa (though I confess to many a morning consoling myself with those chocolatey ones, relishing in the cocoa-sweet milk they make). It's funny how we can miss the little things; I still buy my dental floss in the US, of all things! Yes, I was always frustrated that there were Cocoa Krispies but no regular ones. I just ate through several boxes of Rice Krispies in the last couple of weeks. Somebody needs to stop me.